In the word of Orison Swett Marden…. 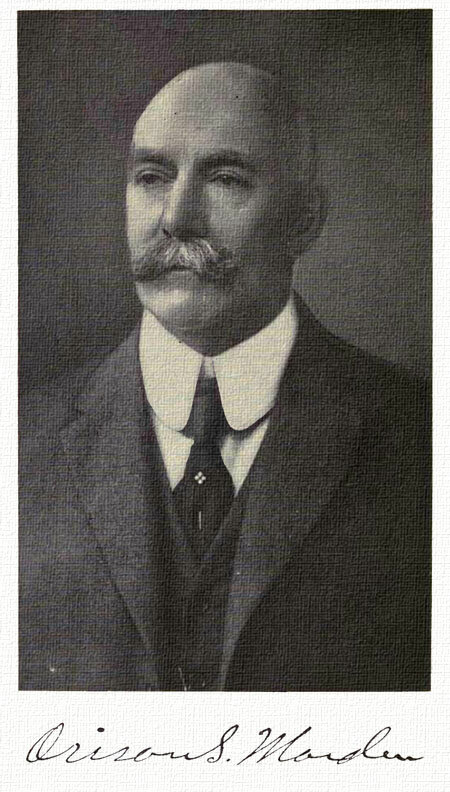 Orison Swett Marden was an American spiritual author in the New Thought Movement. He also held a degree in medicine, and was a successful hotel owner. He died in 1924 at the age of 74. Marden was born in Thornton Gore, New Hampshire to Lewis and Martha Marden. When he was three years old, his mother died at the age of 22, leaving Orison and his two sisters in the care of their father, a farmer, hunter, and trapper. When Orison was seven years old, his father died from injuries incurred while in the woods, and the children were shuttled from one guardian to another, with Orison working as a “hired boy” to earn his keep. Inspired by an early self-help book by the Scottish author Samuel Smiles, which he found in an attic, Marden set out to improve himself and his life circumstances. He persevered in advancing himself and graduated from Boston University in 1871. He later graduated from Harvard with an M.D. in 1881 and an LL.B. degree in 1882. People who have accomplished work worthwhile have had a very high sense of the way to do things. They have not been content with mediocrity. They have not confined themselves to the beaten tracks; they have never been satisfied to do things just as others so them, but always a little better. They always pushed things that came to their hands a little higher up, this little farther on, that counts in the quality of life’s work. It is constant effort to be first-class in everything one attempts that conquers the heights of excellence. This entry was posted in Advice, Mind over matter, Positive Thinking, Power of the subconscious and tagged Boston University, Health, mind over matter, New Hampshire, New Thought, New Thought Movement, Orison Swett Marden, positive thinking, power of the subconscious, present tense, Samuel Smiles, United States by dp@large. Bookmark the permalink.